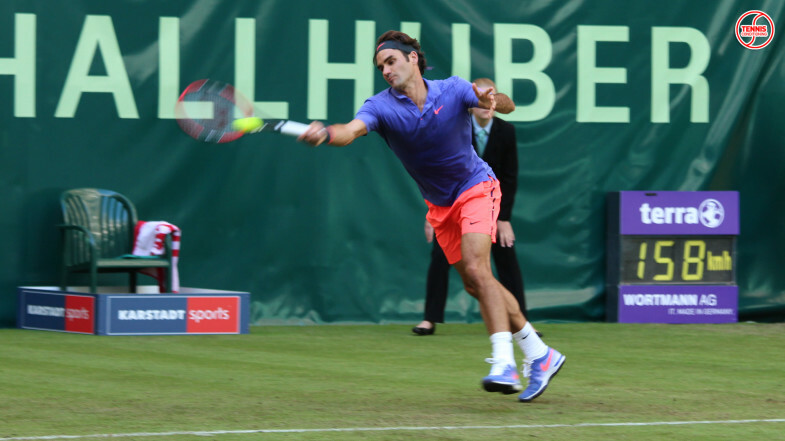 It’s day 3 here at the Gerry Weber Open in Halle, Germany, an ATP 500 event, and we have four interesting matchups today including Roger Federer (SUI) vs Ernests Gulbis (LAT) as the match of the day. The 1st match of the day Florian Mayer (GER) beat Steve Johnson (USA) in straight sets, 6:3/7:6(4) and Mayer is going to play Roger Federer or Ernest Gulbis in the quarters. German talent Alexander “Sascha” Sverev (GER) is facing Ivo Carlovic for a spot in the quarterfinals. Zverev won the 1st set 7:6 (5) when Carlovic missed an easy backhand volley at 5:5 in the tie-breaker. Karlovic maintained his level of play throughout the 2nd set, tried to keep the pressure high by rushing to the net whenever possible, played confidently during the important points and hence was able to change the momentum of the match – one break was enough to win the set 6:3. Both players held their serves in the beginning of the 3rd set until Karlovic got the first break at 3:4. Alexander Zverev committed more enforced errors and lost his edge mentally as he wasn’t able to maintain his level of play. After just over 2 hours Karlovic was able to break Zverev for a second time to close out the match 6:3. 3rd match on center court is going to be Tomas Berdych (CZE) vs Borna Coric (CRO) followed by (not before) Roger Federer (SUI) vs. Ernests Gulbis (LAT). 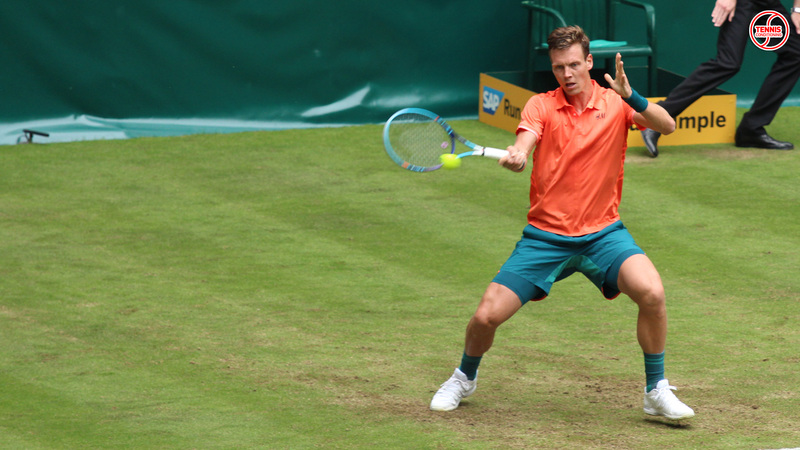 Tomas Berdych played aggressive from the start and broke the 2nd service game of Borna Coric to lead 3:1. Berdych held his serve and was up 4:1 after 16 minutes of playing time. Coric was able to fight back but Berdych wins the 1st set 6:3. In the 2nd set Tomas Berdych is putting on a clinic and breaks Coric twice while holding serve easily; Berdych leads 4:0. Coric doesn’t have the means to contain Tomas Berdych’s aggressive play, especially during the return games. Even when Coric was up 40:0 at 1:5 Berdych was able to get his 1st match point, which he couldn’t convert, and Coric held serve to 2:5. Berdych won the next 4 points and closed out the match 6:2. Not before 17:30 is the match of the day between Roger Federer and Ernests Gulbis. Federer beat Philipp Kohlschreiber 7:6(8), 3:6, 7:6(5) in the previous round and Ernests Gulbis took care of Sergi STAKHOVSKY (UKR) 6:4, 7:6(3). The winner will face Florian Mayer in the quarterfinals.